Air France (AF) has completed the installation of its premium economy cabin on six Airbus A380s, extending the new intermediate class on almost all of its long-haul fleet and network covering 67 destinations. 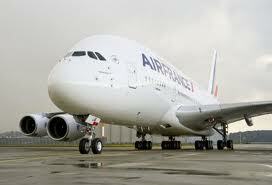 AF started rolling out the premium economy cabin in the fall of 2009. All of its A330s, A340s, A380s and most of its Boeing 777s (except those serving the French overseas territories with high-density seating configuration) are now retrofitted. The French carrier’s premium economy is a separate cabin located between the economy- and business-class cabins, with fixed-shell seats that recline to 123 degrees, have a 38 in. pitch and an individual video screen offering 500 hr. of programs on demand. The meal service is the same as in economy but passengers receive amenities such as noise-reducing headphones, a feather pillow and a wool blanket. On the ground, premium economy passengers have priority check-in and priority baggage delivery.